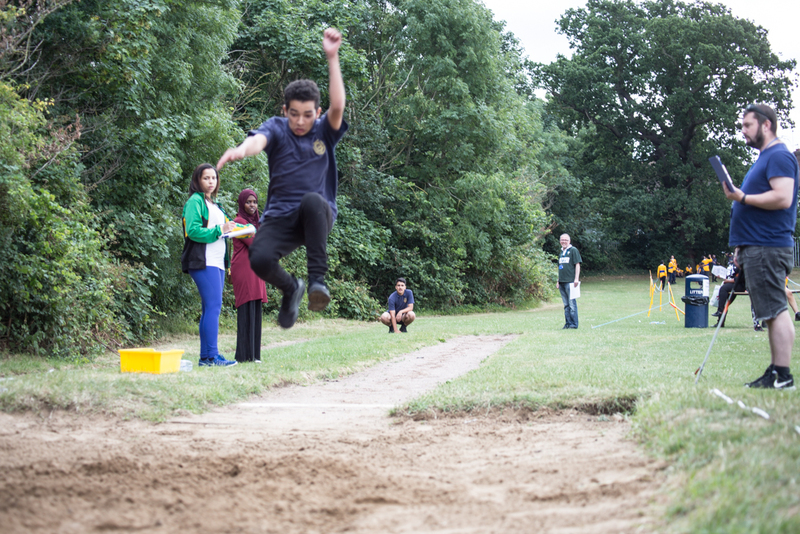 There were some fiercely competitive events that took place and several school sports day records fell! Despite the levels of determination all the competitors showed great sportsmanship and the hordes of spectators for each event helped create fantastic atmospheres that spurred the competitors on. What was most enjoyable to see was that everyone attended participated in one way or another and it seemed that everyone enjoyed themselves. The day really was a credit to the pupils and I hope they are looking forward to next year and the sporting year ahead. Learning to work together to solve problems and preparing for job interviews were just two of the many areas brought together for the Sixth Form’s Employability and Careers Day, which was delivered to Year 12 students by several external organisations, members of the Sixth Form team and former students. In a series of workshops, students were introduced to aspects of the employment process, such as writing CVs and covering letters, performing well at interview, negotiating assessment centre problem-solving tasks and preparing for graduate scheme applications. In addition, students received advice about apprenticeship schemes (including degree apprenticeships) and what employers are looking for in the candidates that apply to them. The Sixth Form says thank you to the organisations that supported this event: Montium Training; Pathways CTM and City Insights; Amazing Apprenticeships; Dynamic Training; and Brent Connexions. We were also grateful to four former students – members of the school’s Future First alumni community – who returned to support our current students: Darshan Chotani (investment banker, Santander); Omar Rasul (auditor at KPMG); Yusef Badi (researcher in Computational Biology); and Natalie Garces-Bovett (assistant producer, Nuffield Southampton Theatres). This was the last piece of the jigsaw in our progression support for Sixth Form students this year, having worked with the students on aspects of the UCAS process, taken students to universities (Westminster, Hertfordshire and Reading) and brought universities into school (Brunel, City, Leicester and Roehampton). We have tried to ensure that Sixth Form students are fully informed for the next step in their lives, whichever route they wish to take. These events followed earlier sessions throughout the year about preparing for life after sixth form: stress management, meditation, healthy eating, surviving university, radicalisation, and the job market today and in the future. On Tuesday 11th July, Year 8 students graduated from the foundation stage of a two year programme entitled the ‘Kingsbury Curriculum’. As part of this curriculum, a series of experiences, called the ‘Kingsbury Guarantee’, were offered to students to allow them to explore their talents and abilities. Students completed extended homework projects and community work, organised events and took part in residential activities. On the evening of the graduation guests were invited to view a short film with clips showing scenes and photos from the various projects in the Tyler’s Hall followed by the graduation ceremony. The Co-Headteachers opened the ceremony welcoming parents, family, friends and carers to the school. Then the Head Boy and Head Girl hosted the ceremony introducing the form tutors who announced the students and their grades. 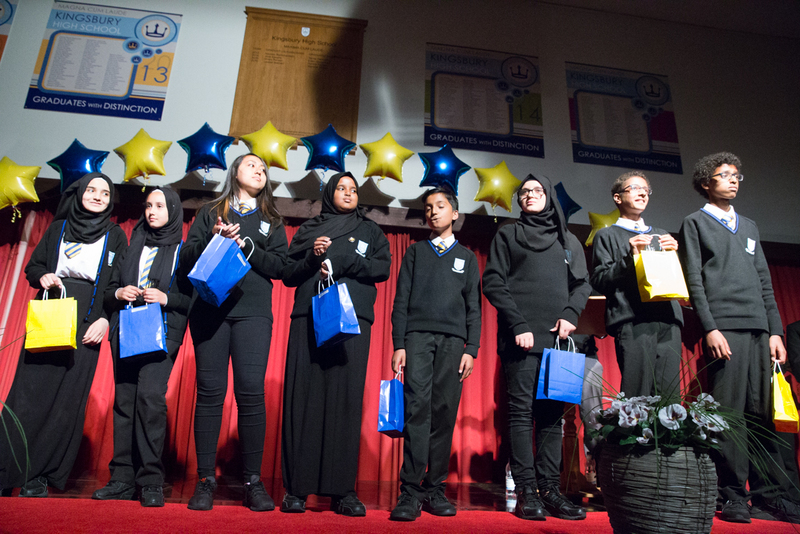 The Year 8 students arrived on stage from a red carpet, to receive their graduation gift bags and, shortly afterwards, their framed graduation certificate. Guests were treated to three performances from our exceptionally talented students, Khalid and Lujein and their touching performance of Hallelujah, Xane (Miles) and his thoughtful poet and finally our energetic dancers Ruxandra, Ariana, Denisa and Bianca. The evening culminated in the unveiling of the 2017 honours board in the Tylers Hall. Jay Parekh and Abhishna Yogarajan.received the trophies for the most highly praised boy and girl graduates. KHS celebrated two days where all the students and staff came together for the schools’ third Olympiad in its history. The Year 13 students had to organise an event for about 30 students as part of one of their modules, instead they turned to Ms Woodrow, wanting to organise an event for the whole school, over two days. They have worked hard to organise such a huge project. We are very proud of our student leaders and the work that they do for the School. 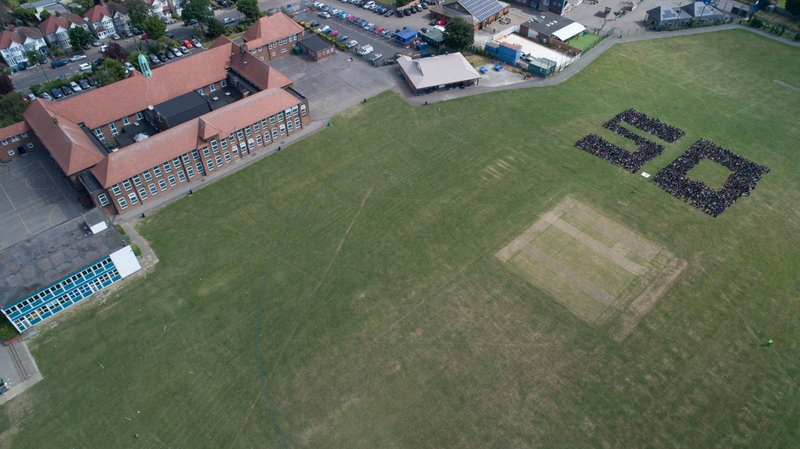 91 teams, all named after former members of staff, baked, made art, danced, completed team challenges, went on a treasure hunt, took part in quizzes and maths challenges, sang, performed, competed in relays, posed as a 50 for a drone and all ended up in the K sports hall for a big finale. The KHS flag was handed over from the former head boy and head girl to the new student leadership team and all 1700 students sang the Kingsbury song they were taught during one of the sessions. Huge congratulations to all the students for organising this event and creating the legacy. Last night KHS saw the Year 13s return to the school to celebrate their achievements during the Sixth Form Reunion and Awards Ceremony 2017. The evening started in the library where students, parents, guardians and staff enjoyed some refreshments whilst talking about their time at the school and what the future may bring. This was followed by the main presentation in K Hall. Everyone enjoyed a video showing their highlights and time at the school and sixth form, bringing back some great memories from the past. To conclude the evening, staff presented the Subject Awards of Excellence, Enrichment Awards and Special Awards. Well done to all of the Year 13s and good luck with your A Level results. Our new Head Boy and Head Girl team, Haider Nazerali and Sara Dehvari, who are both very experienced and successful debaters, hosted Kingsbury’s first ever Lower School Debating Competition. This new competition for KHS gives our younger students an introduction to the various debating events that will take place once they are in Upper School and Sixth Form. The competition built on a highly successful Debating Workshop delivered by the English Speaking Union. 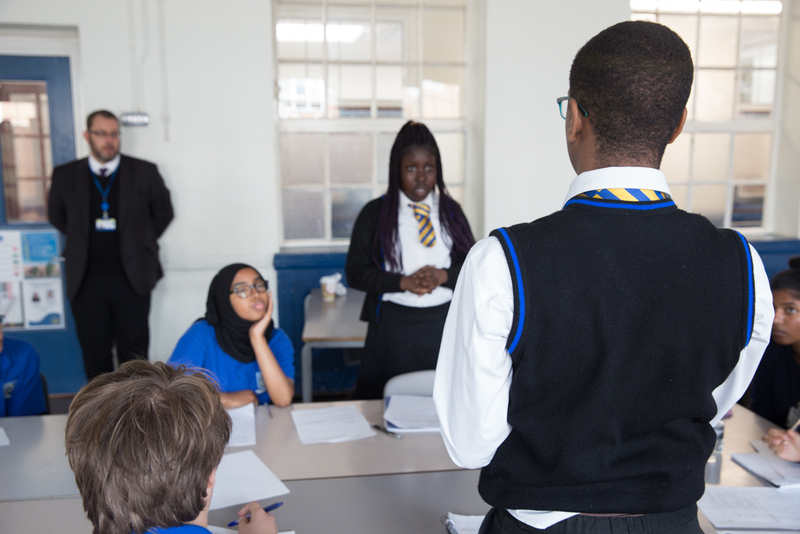 The competition involved 8 teams consisting of Year 7, 8 and 9 students debating their ways through two rounds, ably supported by the fantastic KHS Upper School Debating Society members, who judged each round. Danial Bakhtiari (7K) and Dylan Patel (7G) won individual prizes, whilst the winning team in a closely fought final in K Hall consisted of Xane Miles (8G), Jawad Bokhari (9R), Andrei Crenganis (9Y) and Kailan Gadher (9Y). Winners and Runners-Up received certificates. Thank you to Ms Dusmez and Mr MacKay for running the Lower School Debating Society in Ms Assaad’s absence, and for Ms Tumber for working on debating skills with her Year 9 HPQ students. 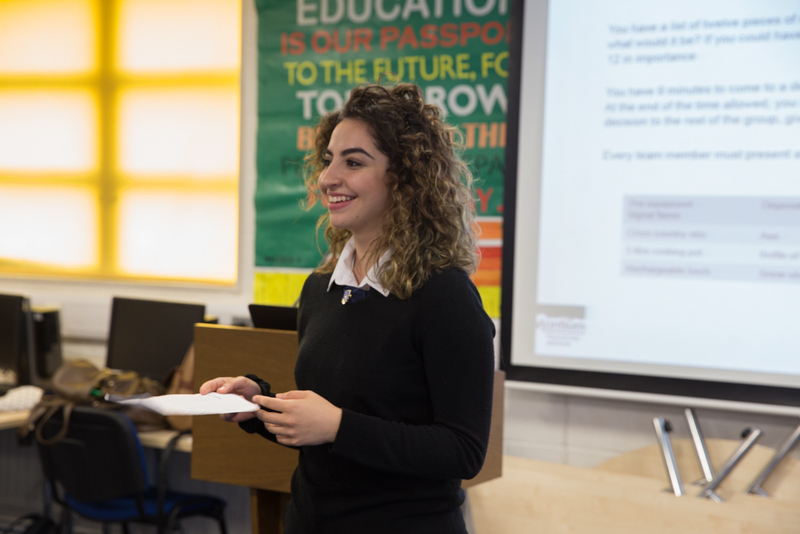 These efforts ensure that we have debating and public speaking skills being developed across every year group of the school and a clear ladder for students to progress in debating during their journey through the school and into the Sixth Form.